VarSeq contains default workflows for Trio analysis which include filter chains for identifying de Novo and Compound Heterozygous variants, but what if you have data for a full Quad or even just a few siblings? 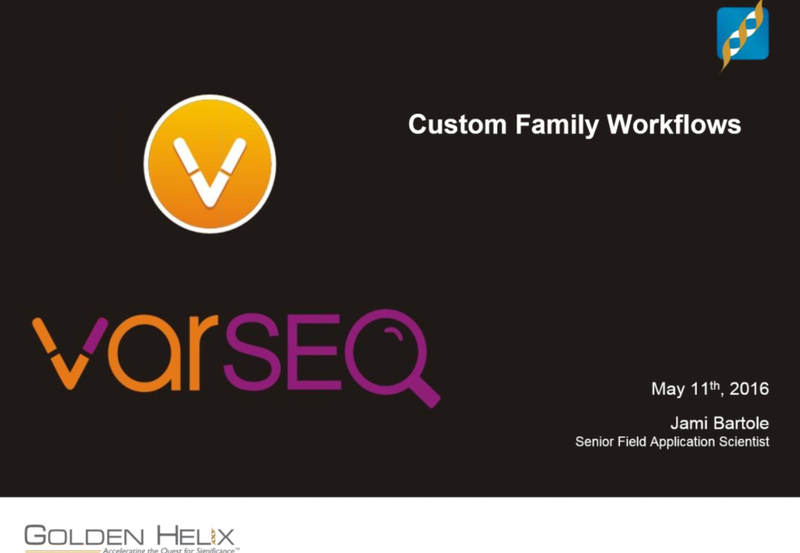 How could your VarSeq workflow be adjusted to handle this custom family structure? Jami Bartole came aboard Golden Helix in 2012 and is currently our Senior Field Application Scientist. Prior to that, Jami worked at the University of Montana – Helena College as a Mathematics Instructor and at the Montana Department of Justice as a Quality Assurance Auditor. Jami completed her Masters in Mathematics from Montana State University – Bozeman and her BS in Mathematics from Montana Tech – Butte. In her free time, Jami enjoys reading and spending time with her friends and family.